Department of Dermatology, STDs and Leprosy, Government Medical College, Srinagar, Kashmir, India. A six year old female child with generalized hyperpigmented hyperkeratotic verrucous plaques with nail and dental abnormalities suggestive of ichthyosis hystrix type of epidermal nevus is being reported in view of the rarity of this condition. The term systematized epidermal nevus is used for lesions that are bilateral and excessive and the similarity to the lesions of ichthyosis is emphasized in the term ichthyosis hystrix. The term ichthyosis hystrix is used to describe several rare skin disorders in the ichthyosis family of skin disorders characterized by massive hyperkeratosis with an appearance like spiny scales. This term is also used to refer to a type of epidermal nevi with extensive bilateral distribution . Patients with extensive epidermal nevi or those with epidermal nevi and systemic abnormalities should be suspected of having the epidermal nevus syndrome . An estimated one third of individuals with epidermal nevi have involvement of other organ systems; hence, this condition is considered to be an epidermal nevus syndrome (ENS). A six year old girl child presented to the outpatient department of Dermatology, STD and Leprosy SMHS hospital (associated teaching hospital of Government Medical College Srinagar) with history of multiple warty lesions all over the body. Her mother reported that the child was a product of full term, normal vaginal delivery, delivered at home with no history of consanguinity and with normal developmental milestones. When the child was about two months of age, parents noticed small, skin coloured, velvety lesions on her right middle finger. Gradually, over years the lesions became darker and more warty and spread to involve other digits of right hand, and then other limbs and trunk. The lesions were not associated with pruritus, blister formation or secondary infection. No relevant history of seizures, mental retardation, headache, arthralgias, visual or hearing abnormalities were found. None of her siblings or parents had history of any skin disease. Drug history of mother during pregnancy was not significant. General physical examination and systemic examination were within normal limits. On cutaneous examination bilateral, more or less symmetrical, linear [along the lines of Blaschko], hyperpigmented, hyperkeratotic, verrucous plaques were found over the dorsa of fingers extending to the dorsal surface of hand with greater involvement of right side than left (fig 1, 2). Both dorsal and plantar surface of feet were involved in a related but less severe fashion (fig 3). Isolated hyperpigmented, hyperkeratotic papules were noticed in a linear pattern over extremities more over the extensor surface. Similar papules were present over ear lobes, neck, and umbilicus and on trunk along axillae and groins (fig 4). Scalp, face and palms were spared. Finger nails of the involved digits were dystrophied. Dental abnormalities in the form of enamel hypoplasia were seen on central and lateral incisors of upper jaw while hair and mucosa were normal. Fig 1: Generalised Hyperpigmented, verrucous plaques and papules particularly around the umbilicus. 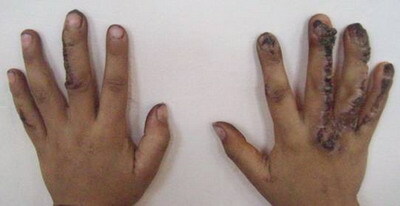 Fig 2: Linear (along Blashcko's lines) verrucous plaques over dorsa of fingers. Fig 3: Linear hyperpigmented, hyperkeratotic plaques over planter surface of feet. Fig 4: Linear skin coloured papules and plaques over inner aspect of upper arms. Detailed neurological, opthalmological, otolaryngological and orthopedic consultations were sought and revealed no abnormalities. Routine investigations on blood and urine were within normal limits. Calcium and phosphorus levels were normal. Ultrasonographic examination of abdomen was also normal. Skeletal survey in form of X-rays did not reveal any abnormalities. Histo-pathological examination of a representative lesion revealed acanthosis, papillomatosis and hyperkeratosis of epidermis. On the above constellation of clinical features (history, typical morphology and generalized, roughly bilaterally symmetrical involvement) a diagnosis of ichthyosis hystrix type of epidermal nevi (systematized epidermal nevus) was made. Epidermal nevi arise from the embryonic ectoderm, which differentiates not only into keratinocytes but also into cells forming the epidermal appendages, therefore these nevi are best classified according to their predominant component into keratinocytic (non-organoid) nevi and organoid nevi such as sebaceous, follicular, and sweat gland nevi. Keratinocytic (non-organoid) nevi are also known as nevus verrucosus and verrucous epidermal nevus. These nevi occur mainly on the trunk and limbs, although occasionally the head is involved, particularly as part of a very extensive lesion. They may be congenital but in over 50% of cases the onset is after birth, usually in the first year of life but occasionally as late as adolescence. The term systematized epidermal nevus is used for lesions that are bilateral and excessive and the similarity to the lesions of ichthyosis is emphasized in the term ichthyosis hystrix . Ichthyosis hystrix is a descriptive term for a heterogenous group of skin conditions characterized by massive, spiky and warty accumulations of hyperkeratosis. In 1954, Curth and Macklin described a family affected to varying degrees with palmoplantar keratoderma and symmetric involvement of dark, verrucous hyperkeratosis, a disorder now called as ichthyosis hystrix of Curth & Macklin. It is an autosomal dominant disorder that clinically resembles epidermolytic hyperkeratosis. Clinical expression varies, even within families, from palmoplantar keratoderma to a severe, generalized involvement. There can be widespread, patchy, thick, grey-brown hyperkeratosis, most marked on extensor surface of arms and legs. Patients with extensive involvement resemble those with severe epidermolytic hyperkeratosis without palmar/plantar involvement with verrucous or porcupine-like (hystrix) hyperkerkeratosis. However, in contrast to epidermolytic hyperkeratosis, blistering does not occur. Histological examination of the epidermis shows acanthosis, papillomatosis, and severe orthokeratotic hyperkeratosis, with frequent binucleate cells . Study of three generation family with ichthyosis of Curth and Macklin identified a mutation in the variable tail domain (V2) of the keratin -1 gene . Patients with extensive epidermal nevi or those with epidermal nevi and systemic abnormalities should be suspected of having the epidermal nevus syndrome (ENS). Epidermal nevus syndrome has been synonymously linked with Schimmelpenning syndrome, Feurstein-Mims syndrome, and Solomon syndrome . Epidermal nevus syndrome affects men and women equally and presents within the first 40 years of life. Inheritance is mostly sporadic. Although the exact incidence of epidermal nevus syndrome is unknown, a study of 119 cases of epidermal nevus syndrome showed that 33% of patients showed two or more abnormalities, 16% showed two or more abnormalities, 10% showed three or more abnormalities and 5% showed five or more abnormalities . Solomon and Esterly  provided a detailed account of the spectrum of epidermal nevi seen in the epidermal nevus syndrome. They described seven types of lesions. The majority of patients had nevus unius lateralis; 20 percent of patients had ichthyosis hystrix. Mucocutaneous changes other than epidermal nevus which may be associated with ENS are haemangiomas and pigmentary changes found in 10 to 20 percent of patients . Less common findings are hair abnormalities, dental abnormalities, and dermatomegaly; various cutaneous tumors may develop within the epidermal nevus. A wide range of skeletal abnormalities has been reported [7,8,9]. The incidence of skeletal changes has ranged from 15 percent to 70 percent. Neurologic abnormalities occur in 15 percent to 50 percent of cases. 9 to 30 percent of patients with epidermal nevus syndrome have ocular abnormalities . The major treatment consists of symptomatic therapy of the complications and for cosmetic purposes. The various modalities involve excision of small nevi, while treatment of the larger and facial nevi involves application of topical preparations, cryotherapy, electrodessication, dermabrasion, curettage and skin grafting. A diagnosis of epidermal nevus syndrome should be thought in patients with extensive epidermal nevi and or systemic abnormalities. A thorough muco-cutaneous, neurologic, ophthalmic and orthopaedic examination is necessary with specific investigations depending on the involved system. 1. Duncan KO, Geisse JK, Leffel DJ. Benign epithelial tumours. In: Epidermal and appendageal tumours. In: Fitzpatrick's dermatology in general medicine. 7th edn. Eds. Wolff K, Goldsmith LA, Katz S, Gilchrest BA, Paller AS, Leffell DJ. McGraw-Hil Division, NY, 2008:1060-61. 2. Rogers M. In: Epidermal naevi / epidermal naevus syndromes. In: Textbook of Pediatric Dermatology. 2nd edn. Eds. Harper J, Oranje A, Prose N. Blackwell Publishing Ltd., 2006: 1125. 3. Curth HO, Macklin MT. The genetic basis of various types of ichthyosis in a family group. Am J Hum Genet 1954; 6: 371-82. 7. Eichler C et al: Epidermal nevus syndrome: Case report and review of clinical manifestations. Pediatr Dermatol 6:316, 1989. 9. Chow MJ, Fretzin DF: Epidermal nevus syndrome: Report of association with chondroblastoma of bone. Pediatr Dermatol 1989; 6: 358. 10. Mansour AM , Barber JC, Reinecke RD, Wang FM: Ocular choristomas. Surv Ophthalmol 33:339-58, 1989.